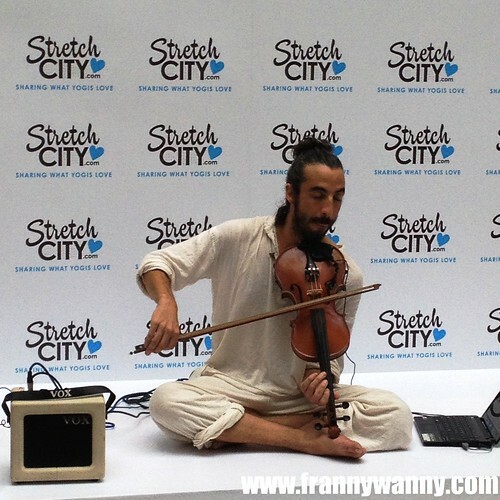 Almost a month ago, Paul and I went to the National Design Centre one Sunday afternoon to check out The Big Ohm Theory. Remember my blog announcement about it before? 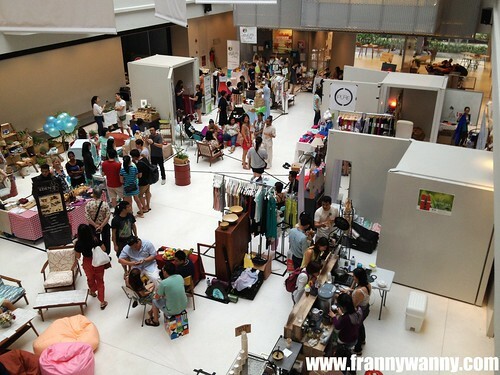 It's a weekend wellness fair where a number of concessionaires came together to present their products which are mostly organic and in line with wellness and yoga. Despite the handful number of products to check out, Paul and I really had a great time as it was just timely that we're starting to become more serious about our over-all well being and most of all, we're trying really hard to eat healthy. 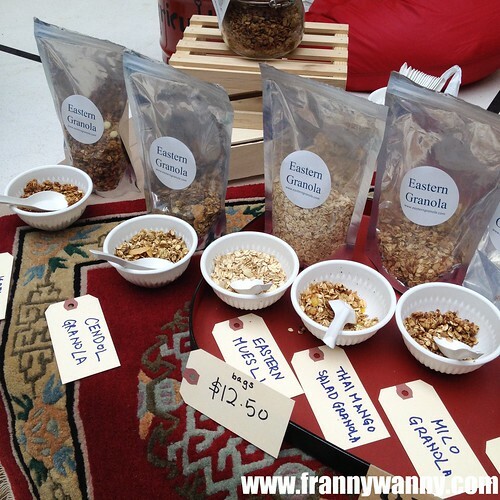 Eastern Granola: Oh this just got the be one of the yummiest find that day. We met this pretty lady who sells homemade granola that comes in several flavors. I was able to try the 5C which has a hint of curry, chocolate and with bits of coconut, cashew and chili. A fantastic creation that perfectly suits the local taste, I believe. Paul tried her Milo Granola and loved it! I tell you ladies, the best way to get your man to have a bowl of healthy oatmeal or granola in the morning is to add ... Chocolate :) I tried a small pack of her Milo Granola and happily enjoyed this for 2 breakfasts after. I tell you, those were like one of the happiest mornings that I've had this year. Since then, their website has permanently been part of my browser's bookmark list. 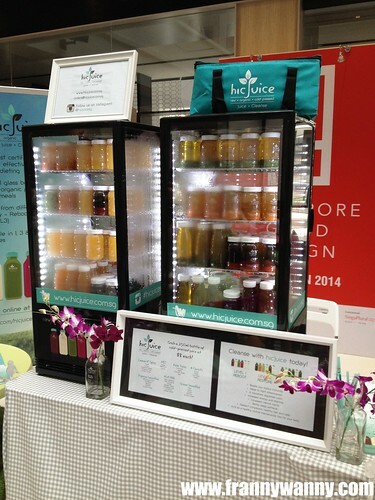 HIC Juice: Ever since I tried the 3-day juice cleanse in Manila, my body has really been looking for it once in a while. It's like a signal from within that it's time to do a reset. I'm glad that Singapore is slowly getting into the juice craze too which means more options for me to choose from when I finally decide to go for the 3-day cleanse again. HIC Juice is conveniently located near my office which is definitely gives them plus points. 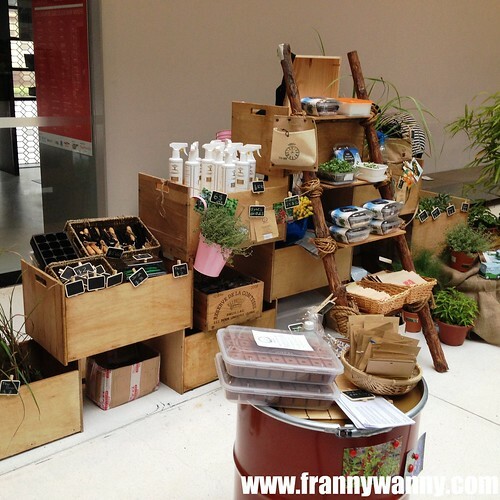 Beside HIC, we also spotted this booth selling herbs in pretty mini pots. Paul and I are considering in growing our own herb garden here for our personal consumption so I quickly got their details which will come in handy should we finally get to planning this someday. 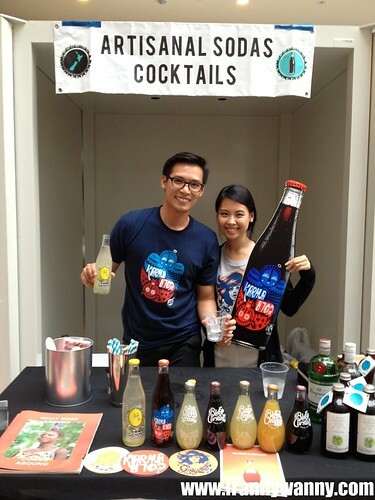 Cold Front Co.: At the far corner, we met this happy couple who are selling bottled beverages from New Zealand. What caught my attention are the cute looking bottles that contain these drinks. Really intrigued by it, we decided to try a bottle to taste for ourselves. 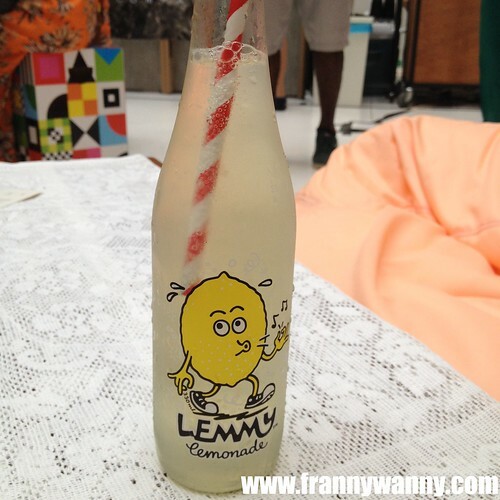 Look how cute the Lemmy Lemonade bottle is! It tastes really refreshing and yummy too. I like that it was more sour than sweet and there was no syrupy aftertaste that would make you cringe. Mofo Chili: Next to the Cold Front Co. booth that sells bottled chili that really set our tongues on fire! Definitely not for the faint hearted but if you love spicy food then you should go for it! It was flavorful but it just went wayyyyy beyond my spicy tolerance. Good thing I had a bottle of Lemmy Lemonade on hand. Whew! 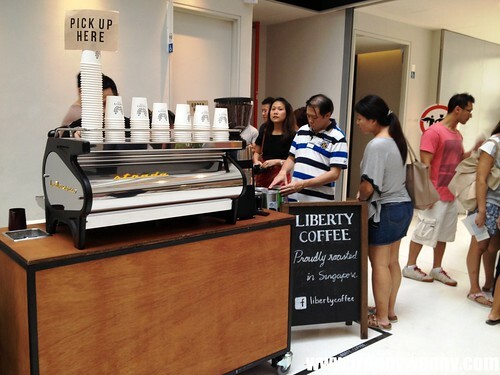 Liberty Coffee: Coffee lovers all enjoyed getting their cup of handcrafted java here. I skipped this though as I was happy with my drink already. 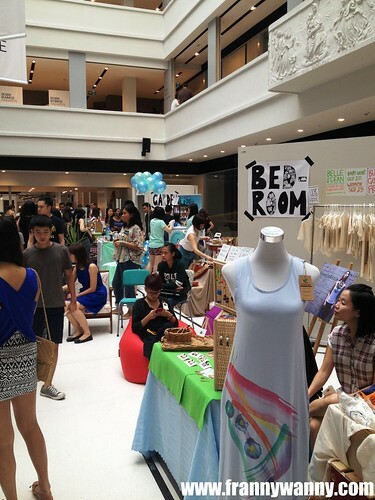 Aside from food, they also have a number of home and fashion products available. 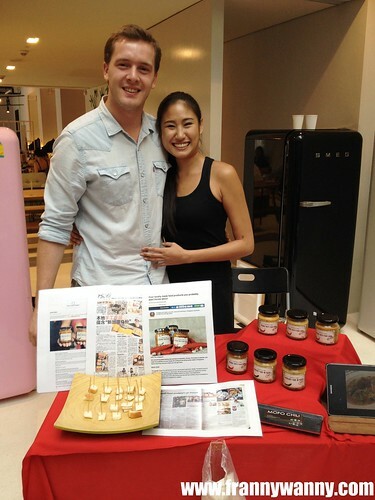 Paul and I visited Glambue which sells dining wares made out of bamboo. Their products sold like hotcakes that sadly they were left with just a few pieces when we visited mostly in blue and green. Too bad as I was eyeing to having a bright red or orange mixing bowl. Then there's Zhai Collection that sells clothes made out of bamboo fiber. This reminded me of the baby clothes I got my friend A which are made of organic cotton. I'm truly a big fan of anything organic, eco-friendly and mineral. The less chemical used and carbon footprint made, the better. I believe this was the first-ever The Big Ohm Theory event and with all these cool finds, I do hope they'll consider doing this quarterly or more. For now, follow them on Facebook to get the latest news and updates, okay?